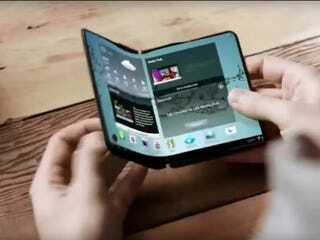 Last year, Samsung promised us foldable phones, possibly unveiled by this January. That date is clearly long gone, but sources tell Bloomberg that the new launch date could be early 2017, so maybe we won’t have to wait so long to decide if this is something we all actually want. In the latest report, sources said the company wants to release two phones, and one of them will have a five-inch handset that turns into an eight-inch tablet. A recent Samsung patent shows a smartphone that folds directly in half, almost like the flip phones of yore. Foldable phones aren’t a new idea. There have been ideas for tri-fold smartphones, and companies like Sony and Sharp have been messing around with the technology too. Samsung does seem to be the company closest to taking the idea to market and its foldable-phone project, codenamed “Project Valley” has been in the works for a while. The company even had a concept video a couple years ago, but whether people are really clamoring for a foldable phone is a different question. Sources say phones could finally debut at Mobile World Congress in February though, seeing how we were burned last September, they could also...not.